Alcott Fall Workshops are here! Looking for before or after school enrichment for your child? Click here to view the list of fall workshops. Start your child’s day off right with a new Mindfulness class. Exercise the brain with Boardgames and Puzzles, or building in the Makers Club. Stretch your body with Before School Sports or Bollywood Dance. Sample and cook healthy foods in the Kids Test Kitchen. All workshops begin week of 10/1 and run thru Mid-November and are held at Alcott. Classes are 6 weeks in length. Registration is now open thru the online system, Family ID. Financial Aid is available and all requests remain confidential. To register click here or here. Program flyer went home in your child’s backpack last week! If you have any questions, contact the PTG workshop committee (alcottworkshops@gmail.com). METCO Family Friends Apple Picking trip is October 9th: Boston families, If your child does not participate in METCO Family Friends, this event is still open to you. If your child is not paired with a Concord friend and you would like them to be, please email Deniere Watford-Jackson with any suggestions of children/families you would like to connect with. Apple picking is an offsite/after school event and transportation to and from the orchard must be arranged by you or your buddy family. Just a reminder, all students are dismissed on Tuesday's at 12:30pm. 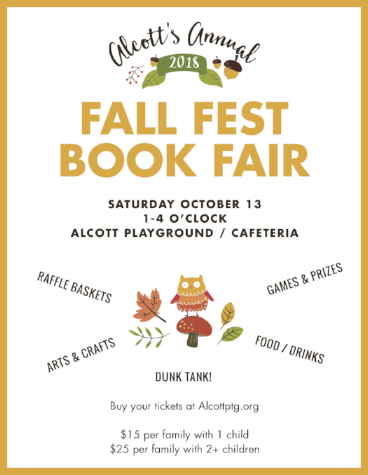 Alcott’s 2nd Annual Fall Fest is Saturday October 13th from 1-4pm! Look for Sign Up Genius via The Thursday Owl. Tickets on sale next week or online now! Tickets are $15.00 per family with 1 child or $25.00 per family with 2 or more children. Click below to buy them now with PayPal.